Fast Food News: New Salads from Carl's Jr. 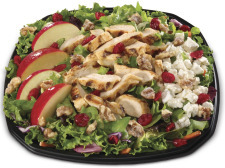 The Cranberry, Apple Walnut Grilled Chicken Salad (pictured) has grilled chicken on top of feta cheese and apple slices, served with dried cranberries, glazed walnuts and a raspberry vinaigrette dressing. It has a total of 460 calories (300 for the salad and 160 for the dressing) and is priced at $4.99. The Southwest Grilled Chicken Salad has warm grilled chicken on top of sliced red onions, roasted corn and black beans, shredded cheese and bacon bits with a chipotle Caesar dressing and tortilla strips. This salad has 710 caloris (440 for the salad and 270 for the dressing) and is also $4.99. Original Grilled Chicken Salad has Warm grilled chicken on top of red onions, shredded cheese, tomatoes, cucumber slices and croutons served with a choice of dressing. This salad (without dressing) has only 200 calories. Add Carl's Low-fat Balsamic Dressing (which has 35 calories) and you're still under 250 calories for this salad. It is priced at $4.79. The underlying salad mix for all 3 salads was also upgraded to a blend of more than 10 varieties of lettuces including Green Leaf, Baby Spinach, and Arugula. Carl's has picked Kim Kardashian to introduce the new salads. In the video below, Kardashian invites viewers to join her for an interactive lunch on January 13 on Carl's Facebook page. During the interactive lunch, Kim will chat via webcam with consumers while enjoying her favorite Carl’s Jr. salad. Consumers who purchase any of the new salads between Wednesday, Dec. 30 and Tuesday, Jan. 12 will be given a code granting access to ask Kim questions during the lunch date. No code is required to simply watch the event via streaming video. Very interesting! Some really good info on the fact food places people might not know about. Wow, I think that the food are very delicious though you should also remember to eat right to prevent from gaining too much weight because of eating. I think it's a very interesting topic. First, I find it a little troublesome that a fast food palce like Carl's Jr. is using "health-washing" in order to sell more, and that easily enticed consumers see the beautiful Ms. Kardashian and think these salads are the key to her success. First of all: No, thousands of dollars are the key to her success. Trainers, dieticians, nutritionists, etc. BUT, I do ask myself... do I try to summon hope somewhere deep down past all my cynicism? At least the word "Salad" is coming up on these menus and is trying to drive the idea home that we need to start making healthier meal choices. Baby steps, my friends. Baby steps.